The Community Foundation of Tampa Bay creates connections and inspires giving that invests in the work of nonprofits and helps ensure long-term sustainability. Endowment Match Challenge: We offer matching grants for nonprofits that establish or add to endowments at the Community Foundation. Nonprofits must apply and be approved to take advantage of the program. Qualifying contributions are matched 1 to 3 by the Community Foundation. Maximum contribution by the Foundation is $100,000. See application and terms. Community Foundation of Tampa Bay Nonprofit CEO Leadership Program: We select about 20 local nonprofit CEOs annually for our comprehensive, year-long professional development program focusing on creative problem-solving and effective management. Other services: We offer expert guidance and accessibility to alternative ways for your donors to support your nonprofit through planned giving, including charitable gift annuities, gifts of appreciated stock, real estate or other complex gifts. Competitive grants: We award competitive grants each year to nonprofits to support a range of projects and initiatives. The grants application period for this fiscal year has ended. Applications will be accepted again in Fall 2019. Donor grants: Donors who have established giving funds with us can recommend grants to nonprofits from those funds at any time. We work with our nonprofit partners to present giving opportunities to our donors throughout the year. The Community Foundation of Tampa Bay helps nonprofit organizations build sustainability and a legacy. For many nonprofits, creating an endowment – a permanent fund invested for long-term growth — is a one way to do that. We will work with you to establish an endowed fund that will support your organization’s financial future — and allow you to focus on your mission. 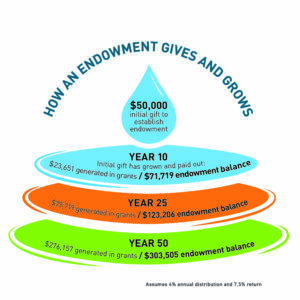 Endowments at the Community Foundation range from the minimum of $25,000 to more than $5 million. When you place your endowment funds at The Community Foundation of Tampa Bay, you reassure donors that funds earmarked for the future will be carefully, expertly managed. The Community Foundation manages your endowment as part of a high-performing investment pool. A semi-annual distribution is made to your organization, consistent with the spending policy adopted by our Board. The current distribution amount is 4%. You also can waive the semi-annual disbursement to help the fund build faster. What’s the return, and how much does it cost? Endowment funds are intended for perpetual asset growth and are invested for the long-term. The average annual return since our inception in 1990 is 7.41%. The administrative fee for service is 0.75%. The investment of our nonprofit endowment funds are professionally advised by AGW Capital Advisors of Tampa and overseen by the Community Foundation of Tampa Bay’s investment committee, which is made up of Board members and other community volunteers with investment expertise. Our large investment portfolio (more than $250 million) increases the opportunity for a better return with lower administrative costs. An endowment shows potential donors that your organization has prepared for long-term stability. And, if your organization ceases to exist, donors have the assurance that their contribution will continue to support a similar cause. We can accept complex gifts – including appreciated stock, real estate, life insurance, and other assets – to benefit your endowment, and we’ll handle the details for you. Our highly experienced investment committee, investment managers and staff are dedicated to prudent investment of your endowment assets. We provide all the necessary data to meet your reporting and disclosure requirements. Statements, investment holdings, performance, and total costs are reported quarterly. Click for a list of nonprofits that have established endowments with the Community Foundation of Tampa Bay. The Community Foundation of Tampa Bay is excited to announce a new initiative to support the financial sustainability of local nonprofits. 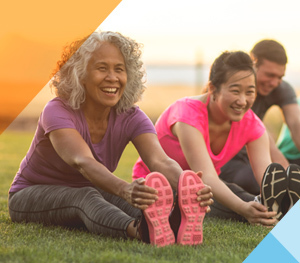 The Match Madness Endowment Match Challenge is providing up to $2 million in matching funds when nonprofits or individual donors create a new endowment with the Community Foundation or add to an existing endowment. The Endowment Match Challenge will provide a 1-to-3 match into endowment funds. The minimum matched contribution is $25,000 (with an additional $8,333 match from the Community Foundation). The maximum matched contribution is $300,000 (with an additional $100,000 match from the Community Foundation). Applications are open now and will be considered on a first-come, first served basis. Applications will be accepted until June 30, 2019. Participating nonprofits have one year from the approval date to meet their endowment goal. Approved nonprofits must place the funds raised in an endowment with the Foundation to qualify for the match. We offer nonprofits the opportunity to save reserved or emergency dollars in a professionally managed fund that remains fully accessible. Reserve funds at the Community Foundation range from the minimum of $25,000 to more than $2 million. These are funds typically are those a nonprofit has built over time for times of emergency, for future projects or for capital needs. Nonprofits can choose to invest the funds for short-term, intermediate or long-term growth. Money can be withdrawn from the fund up to four times a year with the approval of three-quarters of the nonprofit’s board. Money can be added to the funds at any time, and assets other than cash – securities, real estate, etc. – can be contributed.